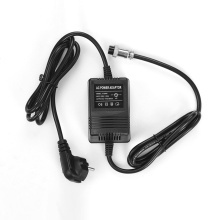 Mixing console power adapter with 3-pin connector: 1 & 3 pins–17V, 2 pin–GND. Input: 220V, 50Hz; output: AC17V 420mA 20VA. Designed with transformer, providing more stable voltage to your mixing console. A great replacement power supply for Yamaha MG16/MG166CX/MG166C/F4/F7/6FX or other mixers with 3-pin power connector.